A sea turtle caught in lobster rigging was rescued by Coast Guard personnel Wednesday morning. 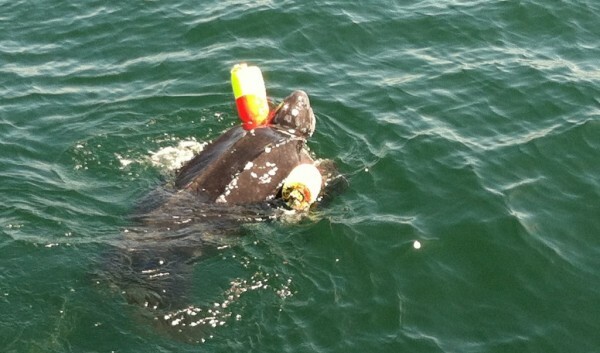 JONESPORT, Maine — A giant leatherback turtle was rescued Wednesday morning by a U.S. Coast Guard crew that noticed the creature was entangled in lobster pot rigging a half-mile south of Great Duck Island. The island is in the Gulf of Maine south of Mount Desert Island. Koch estimates that the turtle was 5 feet long and weighed between 300 and 400 pounds. Correction: An earlier version of this story incorrectly stated that Great Duck Island is in Frenchman Bay. The island is in the Gulf of Maine south of Mount Desert Island.